Rolling-element bearings are a tried-and-true technology that serves many motion control applications. However, when precision motion, repeatability or accurate performance is required, air bearings offer many technical benefits. Non-contacting when in operation, air bearings avoid many of the problems associated with conventional bearings including friction, wear, and lubricant handling. 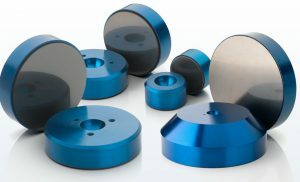 Offering distinct advantages in precision positioning and high-speed applications, air bearings are ideal for linear and rotary motion, non-contact handling and sealing and balancing applications in markets ranging from metrology, automotive, converting, optics, flat panel display, semiconductor and even oil and gas. Below are outlined benefits of designing with air bearings. 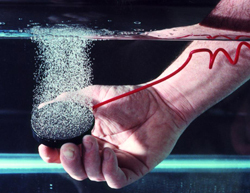 Air Bearings allow designers to push the envelope on precision and high-speed applications. Unlike contact roller bearings, air bearings utilize a thin film of pressurized air to provide a ‘zero friction’ load bearing interface between surfaces that would otherwise be in contact with each other. Being non-contact, air bearings avoid the traditional bearing-related problems of friction, wear, and lubricant handling, and offer distinct advantages in precision positioning and high-speed applications. The fluid film of the bearing is achieved by supplying a flow of air through the bearing itself to the bearing surface. Unlike traditional ‘orifice’ air bearings, New Way Air Bearings deliver the air through a porous medium to ensure uniform pressure across the entire bearing area. The design of the air bearing is such that, although the air constantly dissipates from the bearing site, the continual flow of pressurized air through the bearing is sufficient to support the working loads. Broadly speaking there are two techniques for achieving the compensating effect in air bearings. Orifice compensation is traditionally the most widely used method, but porous surface compensation is rapidly emerging as the method of choice due to its many advantages and increasing availability. 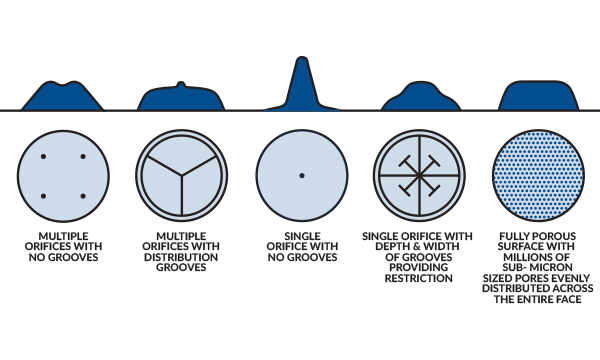 In traditional orifice compensation, the precisely sized orifices are strategically placed on the bearing and are often combined with grooves to distribute the pressurized air evenly across the bearing face. However, if the bearing face becomes scratched across a groove or near an orifice, the volume of air that escapes may be more than the orifice can supply, causing the bearing to crash even with normal air supply pressure. Rather than the small number of orifices of conventional air bearings, Porous Media air bearings control the airflow across the entire bearing surface through millions of holes in the porous material (see figure). Because of this they are harder to clog and will still fly even after being severely scratched. Even under normal operations, the air in an orifice air bearing loses pressure and creates pressure gradients in the air gap as it expands away from the orifice or groove. This is not an issue for porous air bearings where the air pressure remains almost uniform across the entire surface (see figure below). Porous carbon has been found to be one of the best materials for this purpose, producing an ideal supply of uniform air pressure across the face of the bearing while automatically restricting and damping the air flow at the same time. The carbon surface also provides greater bearing protection if there is an air supply failure, and allows the bearings to be moved during air failure without damaging the support surface. This design resource provides in-depth information about New Way air bearings, design and application assistance, care and maintenance guidelines, and much more. Note: This is a large file, which takes longer to download than usual. Your patience is appreciated.